Soon enough the same bright-hued leaves that warmed and colored the tree-lined streets of metro Detroit will be descending to your lawn, marking the nearing winter season. But for now, while enjoying the surrounding autumn beauty, make sure to follow some fall lawn care guidelines to maintain a healthy yard through winter and into spring, at your rental property and your own home. Make sure your lawn is appropriately mowed: You may not have to mow the lawn much in the fall, but keeping it short (about 2 inches tall for most grasses) will prevent the grass from being matted down by leaves and snow. Pay attention not to over cut though, as grass that is too short has fewer roots, allowing room for weeds to settle in. As a general rule: never cut more than 1/3 of the grass blades at any one time. Control weed growth now: while perennial weeds like dandelions are easier to spot in the warmer months, the best time to defeat them is in the fall, when they are absorbing all the nutrients they can. Whether using herbicide granules or sprays, weed killers are best if used in steady temperatures above 60 degrees Fahrenheit and when the soil is moist. Fertilize for future months: Experts in lawn care agree, fall is the best time to fertilize, especially if you rarely do. This is due to the fact that while grass is short and slowly growing, its roots are still growing quickly- and fertilizer can help grass establish deep roots for optimal spring growth. Often just one application in early September and another in late October or early November is enough. In cold regions like metro Detroit, selecting fertilizer rich in nitrogen will allow your lawn the best winter protection. 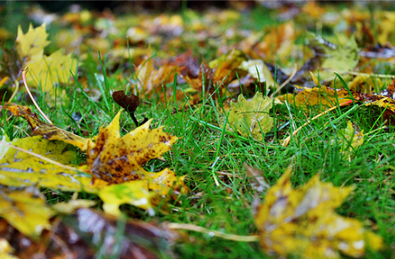 Move the Leaves: Although fall leaves are pretty, they should not be left to accumulate on your lawn all year. A mat of leaves can smother your grass and contribute to the breeding of fungal disease. Instead, rake away leaves and compost them, or use a mulching mower to shred and spread them over your lawn like an organic top dressing.